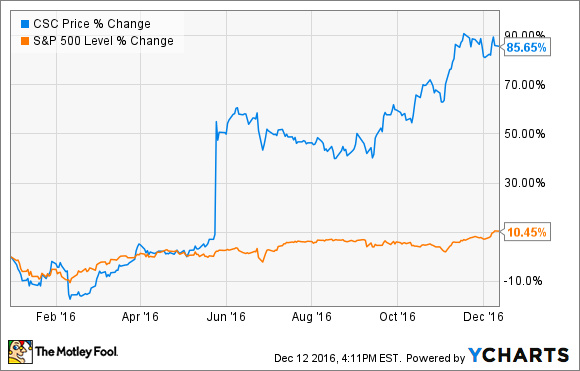 NVIDIA, Applied Materials, and Computer Sciences took very different paths to the top on the 2016 charts. Here's how. The S&P 500 index has gained 10.4% so far in 2016. The market barometer is heading toward a very respectable annual return, well above the 8.2% average gain seen in the last 20 years. But some stocks made even these rosy returns look downright stale by comparison. Sifting through the S&P 500's finest year-to-date performers, the top three names in the tech sector are NVIDIA (NASDAQ:NVDA), Computer Sciences (NYSE:CSC), and Applied Materials (NASDAQ:AMAT). 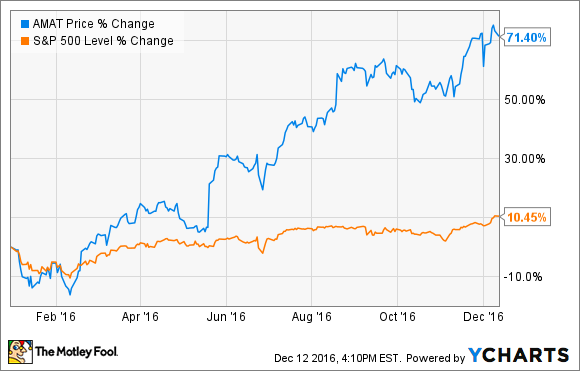 Here's how those three tech tickers have gained 76% or more in 2016. For this semiconductor equipment builder, the 2016 surge was all about showing solid results. Applied Materials has presented four quarterly reports this year, exceeding earnings expectations in each one. The company is taking market share from its chip-building equipment rivals, leading the way with gear capable of churning out 3D memory chips and next-generation manufacturing processes. Investors are benefiting from a strong pre-holiday surge in display panel orders along with an industrywide move toward high-performance SSD storage equipment. The May surprise lifted share prices more than 13% in a single day, and Applied Materials has gained 72% year to date. The stock is exploring multiyear highs, dating all the way back to the dot-com boom 15 years ago. Fresh off a focus-sharpening spinoff of its own, Computer Sciences agreed to merge with the enterprise services division of Hewlett-Packard Enterprise (NYSE:HPE) in May. Computer Sciences shares immediately jumped more than 35% when that announcement was made. That was the start of an 85% year-to-date surge, but far from the whole story. Computer Sciences added an 11% gain in September thanks to a strong business review and new global partnerships in the cloud computing field. The HP Enterprise spin-merger is still pending, expected to close in the first quarter of 2017. Computer Sciences was already a strong player in the enterprise consulting services market, but the addition of HP's competing unit is still a game-changing merger of equals. I can't wait to see how this two-headed beast will evolve as a unified business. And that brings us to the tech sector's strongest performer in 2016. 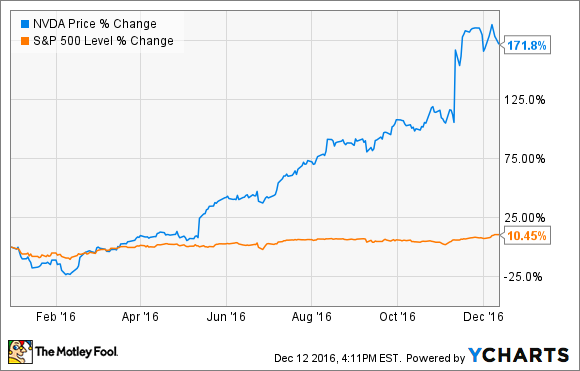 NVIDIA has gone from strength to strength in recent quarters, and share prices have nearly tripled, with a 178% return so far. This is one of those overnight successes that actually were years in the making. The brand new Pascal microarchitecture behind NVIDIA's current range of graphics processors and number-crunching chips has been in development for at least two years. These platform upgrades are not always successful, but Pascal turned out to be a home run in terms of raw performance, power efficiency, and street pricing. Back in May, when the first Pascal-based processors were about to hit the market, NVIDIA CEO Jen-Hsun Huang promised to sell "a lot of Pascal" in the second quarter. The company followed through on that promise and continued to crush every target in the third quarter as well. NVIDIA investors aren't just enjoying multiyear highs these days. The stock has exceeded its dot-com highs by a wide margin and sets all-time records on a regular basis. With Pascal under its belt, Nvidia should be able to keep executing for the foreseeable future, as the company delves deeper into automotive computing and data center server-class products.